Is a race car toddler bed the key to getting your little one to agree to moving out of his or her baby crib? Many little people seem to relish in speed from the time they are tiny, and when they have an innate competitive streak as well, it’s not surprising that they end up fascinated with race cars from a very early age. KidKraft’s RaceCar Toddler Bed is a solid wood race car bed in bright red and blue. The side rails that keep your toddler from rolling out of his bed are actually a built in part of the design; the sides of the race car. The artwork is fun, detailed and realistic. 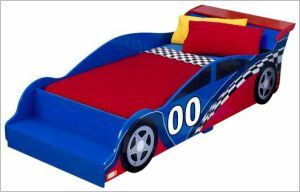 The bumper of this race car toddler bedis a little bench at the footend of the bed, which could double as a step when your child climbs into bed; and the spoiler at the back is a little shelf where you could put a small light or a row of stuffed animals. Although you need to do some assembly for this bed, some pieces will come already put together: what remains should take you only about an hour; less if you are of a DIY-bent. Or do you have a little girl who is all into cars, but not a fan of red and blue? 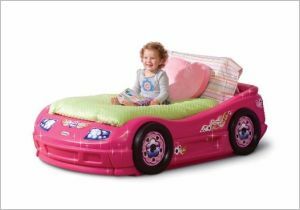 Little Tikes Princess Pink Toddler Roadster bed may be perfect for her—hot pink and glitter, and a fast car to boot! This bed is made of sturdy plastic, and assembly is quite manageable, though you may have to wrestle with some of the pieces as you put them together. Besides the crib mattress that all toddler beds need, this bed also requires a piece of plywood or other support under the mattress to keep it in its place. If you’re not using your daughter’s crib, you can take the plywood straight from there: it should be the same size. This bed also doesn’t include siderails: it is low enough to the ground your child won’t get hurt if she falls out, but if she has a tendency to do so you may want to buy side rails to go with it. In spite of all that, though, this is a high quality toddler bed that any princess aficionadoprincess will fall in love with at first sight. If you bought a Princess Pink Toddler Roadster bed you’ll probably want to choose toddler bedding in subdued tones, so as not to clash with the bright, very decided design of the bed itself. I haven’t found anything nicer than the American Baby Company Minky Dot Chenille 4-piece Toddler Bed Set, pink, and the delicate pink tones go with the bed as if it was made for it. The sheets and back of the pillowcase and comforter are 100% cotton; the front of the comforter and pillowcase 100% polyester, and it has soft plush polka dots all over. No one can help sleeping comfortable with this Minky Chenille bedding. If you bought the KidKraft RaceCar Toddler bed , though, you are likely to want something racy in terms of bedding, and KidKraft has a set especially designed to go with your new bed. The KidKraft Toddler RaceCar 4-piece bedding set. 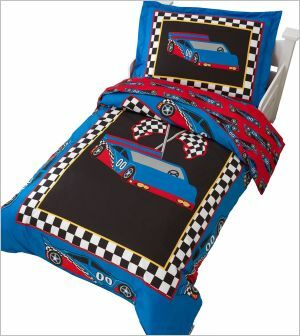 This bedding set-- a comforter, top sheet, fitted sheet, and pillowcase—may not be top notch quality, but nothing can beat it for race car design and complete coordination with the bed. Blue and black are the primary colors of the comforter and pillow sham, with the sheets being predominantly red. Have fun setting up a race car toddler bed for your child, and watch him zoom off into the land of dreams!